Tennis elbow can certainly be caused by racquet sports, but it is common in any sport or occupation that involves gripping or throwing like weightlifting or canoeing, or carpentry and brick laying. You will feel pain with gripping and lifting. WHERE IS TENNIS ELBOW FELT? You’ll feel pain over the outside bump of the elbow. This bump is known as your lateral epicondyle. 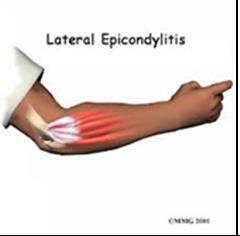 The medical term for tennis elbow is “lateral epicondyalgia” meaning a painful lateral epicondyle. Typically, you’ll suffer sharp localized pain over the bony bump. As the condition deteriorates, the forearm muscles become tender and remain in a spasm-like contraction. Like most overuse injuries, it is most commonly caused by repeated microtrauma. You may not have allowed the injury to ever fully heal and ultimately it becomes increasingly painful. It may also be caused if you do an activity that you are not used to, and your muscles are not strong enough to keep doing the activity, such as pruning in the garden. Research has demonstrated that Physiotherapy treatment can be highly effective in the treatment of acute and chronic “tennis elbow”. Tennis elbow, or “lateral epicondylalgia” as it has more recently been named, often involves more than localized pathology around the elbow. When Should You Use a Tennis Elbow Brace? A tennis elbow brace can be very effective from the moment you put it on. In these instances, the brace will dissipate the stressful gripping forces away from your injured structures. However, tennis elbow braces do not work in 100% of cases. In our experience, we recommend that you seek physiotherapy assistance in these cases. In stubborn cases, you have a very high likelihood of referred symptoms from your C5/C6. Only a thorough examination of your neck, shoulder, elbow and upper limb nerve structures will confirm your diagnosis and direct which treatment options will assist you the quickest.